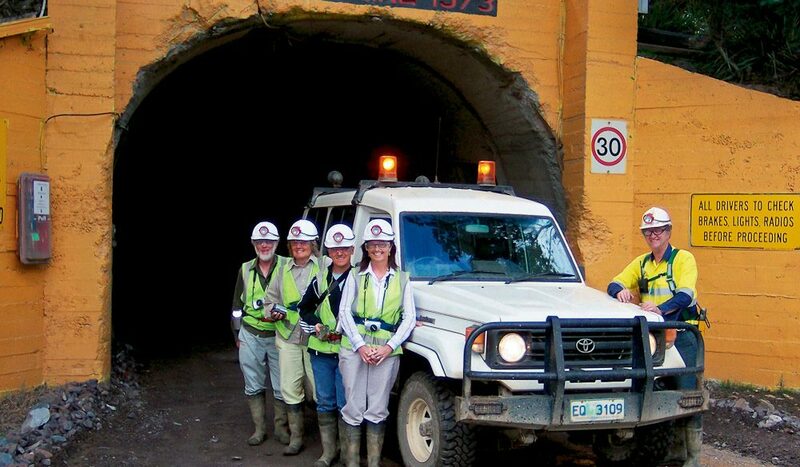 Put your hard hats on and infuriate your insurance broker as you head for a tour on a real working mine. This is the stuff of insurance companies’ nightmares. Touring a real working copper mine. In an era of soaring public liability insurances and the cancellations of school fetes, local shows and swimming carnivals, one oddity stands out: Douggie’s Mine Tours. The only place in Australia (and possibly the world), where you take a tour inside a real working mine. Douggie takes you on a tour of the world’s purest copper deposit at the Mt Lyell mine in Queenstown, Tasmania. This is no half-baked experience; this is the real thing. Safety lamps, oxygen masks, endless safety instructions – more than an hour of the 2.5hr tour is taken up purely on safety drills. Douggie is very, very serious about his safety. And you soon understand why. After corkscrewing 7km to a depth of 2km below ground, you get out of your Landcruiser, turn on your lamps, and trudge single file behind Douggie. WHERE // Queenstown, Tas, 248km west of Hobart on the way to Strahan. Call Douggie direct on 0407 049 612, since he doesn’t use that “new fangled internet stuff”. Costs $70 for a 3hr tour. DID YOU KNOW? // Copper production during the last two world wars was so important that miners weren’t allowed to sign up and fight. Their skills were just too important to lose.